Advanced Recurrent Airframe Training will provide the basic introduction and safety features of your aircraft. The human body’s ability to perform a motor skill diminishes over time if not practiced. The brains ability to recall information diminishes over time if the information is not refreshed. This is just the truth of the human condition and all humans are subject to these laws. When refreshing these skills and knowledge the goal is to not only try to get back to where we once were but to exceed our previous level of performance. ESI courses are specifically designed to target these areas in a manner which is unmatched in the industry. Where as many recurrent programs simply throw arbitrary information at the pilot and hope they get it and test the pilot in the cockpit. ESI courses maintain the mindset that its the instructor who guides the pilot to a higher level of knowledge level and performance. We are not evaluators, we are instructors. Your instructor will arrive with all items needed to conduct the ground school. You and your pilots need simply to sit down and begin the interactive learning process. Single Engine - Hydraulic failures to full touchdown, tail rotor failures to touchdown, full down autorotations, governor failures when applicable. Multi Engine - Hydraulic failures to full touchdown, tail rotor failures to touchdown, full down single engine failures, governor failures when applicable. Each airframe has different requirements for instructional content and flight exam components. Below are the standard time commitments for each airframe. Flight time may be extended at customers request and may also be extended for pilots that require more time to meet certification levels. 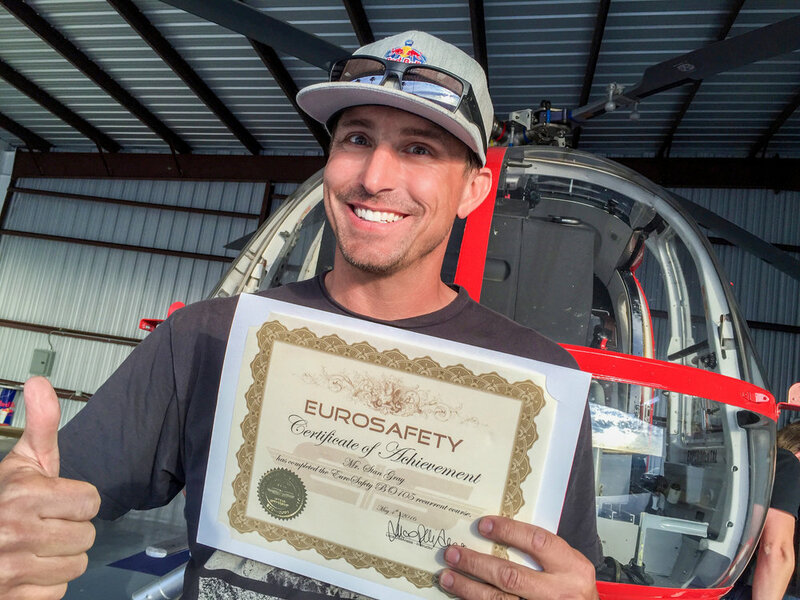 Pilots are awarded a EuroSafety Certificate of Achievement upon satisfactory completion of the written exam and flight training events. All sections must be completed in order to be certified. Pilots will also receive a Photo ID Badge indicating their ratings and complete certifications. Pilots must have completed an initial training program and flown the aircraft in the previous year. A credit card is required to book a training event. Training cancelled between the confirmation of the training event and 60 days prior to the event will incur just the cost of canceling travel reservations. In the event the cancellation of training is within 60 days of the training event will induce a charge equal to half of the total invoice plus airline ticket cost. Cancellation of enrollment within 30 days of departure of the training event will induce a full charge.